The state is divided into counties, cities, towns, and villages. Cities, towns and villages are municipal corporations with their own governments that provide most local government services. Whether a municipality is defined as a city, town, or village is dependent not on population or land area, but rather on the form of government selected by the residents and approved by the state legislature. Each such government is granted varying home rule powers as provided by the New York Constitution. New York has various corporate entities that serve single purposes that are also local governments, such as school and fire districts. New York has 62 counties, which are subdivided into 932 towns and 62 cities; it also has 10 Indian reservations. In total, the state has more than 3,400 active local governments and more than 4,200 taxing jurisdictions. Counties and incorporated municipal governments (also known as "general purpose units of local government"; i.e., cities, towns and villages) in New York State have been granted broad home rule powers enabling them to provide services to their residents and to regulate the quality of life within their jurisdictions. They do so while adhering to the United States Constitution and the Constitution of the State of New York. Articles VIII (titled "Local Finances") and IX (titled "Local Government", but commonly referred to as the "Home Rule" article) of the state constitution establish the rights and responsibilities of the municipal governments. Every county outside of New York City has a county seat, which is the location of county government. Nineteen counties operate under county charters, while 38 operate under the general provisions of the County Law. Although all counties have a certain latitude to govern themselves, "charter counties" are afforded greater home rule powers. 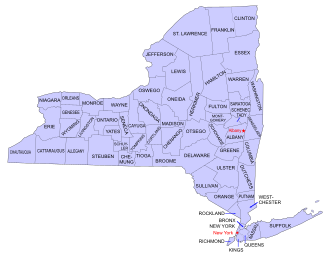 The charter counties are Albany, Broome, Chautauqua, Chemung, Dutchess, Erie, Herkimer, Monroe, Nassau, Oneida, Onondaga, Orange, Putnam, Rensselaer, Rockland, Schenectady, Suffolk, Tompkins, Ulster, and Westchester. Sixteen counties are governed through an assembly with the power of a board of supervisors, composed of the supervisors of its constituent towns and cities. In most of these counties, each supervisor's vote is weighted in accordance with the town's population in order to abide by the U.S. Supreme Court mandate of "one person, one vote". Other counties have legislative districts of equal population, which may cross municipal borders; these counties may also have an elected County Executive. Most counties in New York do not use the term "Board of Supervisors." 34 counties have a County Legislature, six counties have a Board of Legislators, and one county has a Board of Representatives. The five counties, or boroughs, of New York City are governed by a 51-member City Council. In non-charter counties, the legislative body exercises executive power as well. Although the legislature can delegate certain functions and duties to a county administrator, who acts on behalf of the legislature, the legislature must maintain ultimate control over the actions of the administrator. Many, but not all, charter counties have an elected executive who is independent of the legislature; the exact form of government is defined in the County Charter. The forms of government cities can have are council–manager, strong mayor–council, weak mayor–council or commission. Forty-six cities, the majority, use the mayor–council form. Strong mayor–council — An elective mayor serves as the chief executive and administrative head of the city. A city council serves as a legislature. The mayor has veto power over council decisions, prepares a budget, and appoints and removes agency heads. This form sometimes includes a professional administrator appointed by the mayor. Weak mayor–council — The mayor is a ceremonial figure. The city council serves as both a legislature and executive committee. There is generally no mayoral veto. Council–manager — The mayor, if such a position exists, is ceremonial only. A professional administrator, appointed by the city council, serves as the administrative head. While empowered to appoint and remove agency heads and responsible for preparing a budget, the administrator does not have veto power. The city council serves as the legislature. The city of New York is a special case. The state legislature reorganized government in the area in the 1890s in an effort to consolidate. Other cities, villages, and towns were annexed to become the "City of Greater New York", (an unofficial term, the new city retained the name of New York), a process basically completed in 1898. At the time of consolidation, Queens County was split. Its western towns joined the city, leaving three towns that were never part of the consolidation plan as part of Queens County but not part of the new Borough of Queens. (A small portion of the Town of Hempstead was itself annexed, also.) The next year (1899), the three eastern towns of Queens County separated to become Nassau County. 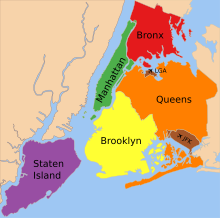 The city today consists of the entire area of five counties (named New York, Kings, Queens, Bronx, and Richmond). While these counties have no county government, boroughs — with boundaries coterminous with the county boundaries — each have a Borough Board made up of the Borough President, the borough's district council members, and the chairpersons of the borough's community boards. A mayor serves as the city's chief executive officer. The most populous and largest city in the state is New York City, with a population of over 8.5 million inhabitants and comprising just over 300 sq mi (777.00 km2) of land (468.87 sq mi (1,214.368 km2) total area, which includes water). The least populous city is Sherrill, New York, with just 3,071 inhabitants in 2010. The smallest city by area is Mechanicville, New York, which covers 0.91 sq mi (2.4 km2) (of which 0.08 sq mi (0.2 km2) is water). Some places containing the word "city" in their name are not cities. Examples include Johnson City, Garden City, and New City. Towns can vary greatly in many characteristics, as shown here. Map showing the boundaries of every town in New York, as well as cities not included within a town. New York City is shown as divided into boroughs. In New York, a town is a municipal corporation, which is the major division of each county (excluding the five counties that comprise New York City), very similar to townships in other states such as Pennsylvania, Ohio, and Indiana. Towns in New York are classified by the U.S. Census Bureau as minor civil divisions. As in most Northeastern states, every square foot of New York is incorporated; all residents who do not live in a city or on an Indian reservation live in a town. These provide or arrange for the primary functions of local government. While some provide most municipal services for all town residents and selected services for residents of villages, some provide little more than road maintenance. There are 932 towns in New York. As of 2000, 45.8% of state residents were living in a town; 35.9% were living in a town but outside of a village. Whereas cities and villages can cross county boundaries, all towns in New York are within a single county. New York towns are classified by statute as being a town of the first class or a town of the second class. Additionally, a town of the first class can further be classified as a suburban town upon meeting certain criteria. Originally, towns of different classes possessed different powers. Since 1964, all towns, regardless of classification, have had the same legal powers as were once available only to suburban towns. Even so, towns of different classifications continue to have organizational differences and certain conditions that must be met before a town's classification changes. The town board serves as the legislative branch. The board is composed of one elected supervisor (or chief executive officer in suburban towns) and a specific number of elected council persons; towns of the second class generally have two but may have four council persons, whereas towns of the first class generally have four but can have two or six. The supervisor presides over the board, voting on all matters but not possessing veto or tie-breaking power. Certain towns operate under a town manager form of government, as permitted by legislation enacted in 1976. All town justices were originally part of a town's board. Today, justices belong to a separate judicial branch known as Town Court or Justice Court, part of New York's Justice Court system. Towns in New York may be further subdivided into wards, although as of 2017, only fifteen of the state's 932 towns used this system. In towns operating under the ward system, citizens vote for councilmen who represent a specific area (ward) of the town, as opposed to the at-large councilmen elected in the majority of the state's towns. The use of "town" in a community's name is irrespective of municipal status. Elizabethtown, Germantown and Stephentown are towns. Cooperstown, home of the Baseball Hall of Fame, is a village, Jamestown and Middletown are cities, and Levittown is an unincorporated hamlet. A census-designated place (CDP) is defined by the United States Census Bureau as "a statistical entity defined for each decennial census according to Census Bureau guidelines, comprising a densely settled concentration of population..." that is not part of a city or a village "...but is locally identified by a name." CDPs may cross town and county borders. CDPs are defined collaboratively by state and local officials and the Census Bureau. They are defined for each census, and it is commonplace to change boundaries and define new CDPs for each census. The Census Bureau formerly referred to CDPs as "unincorporated places" from 1950 through the 1970 decennial censuses. The term CDP was first used for the 1980 census, and minimum population criteria for CDPs were dropped with the 2000 Census. Though the term "hamlet" is not defined under New York law, many people in the state use the term hamlet to refer to a community within a town that is not incorporated as a village but is identified by a name, i.e. an unincorporated community. Hamlets often have names corresponding to the names of a local school district, post office, or fire district. Because a hamlet has no government of its own, it depends upon the town or towns that contain it for municipal services and government. Suffolk County publishes maps that give hamlet boundaries, but towns within the county also publish maps that conflict both in the number of hamlets and their boundaries. Nevertheless, all land not within a village is administered by the town. Most of the rest of New York's hamlets, however, have less defined boundaries, and most towns have areas that are not considered to be a part of any hamlet. The New York State Department of Transportation (NYSDOT) puts hamlet names on rectangular green signs with white lettering at roadside locations of its choosing. The NYSDOT and local governments also provide community identification signs on some scenic byways to be placed at the roadside boundaries of hamlets, as decided by the sign provider. 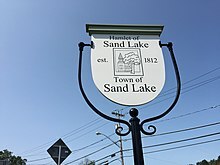 Many towns have special zoning or planning districts and planning strategies for their hamlets, and many place welcome signs at the gateways to the hamlets. Some hamlets are former villages that have dissolved their incorporation (Old Forge in Herkimer County; Rosendale, in Ulster County; and Andes in Delaware County, for example). The Adirondack Park Agency also uses the term "hamlet", though as a land-use classification for private land under its Adirondack Park Land Use and Development Plan (APLUDP). The APLUDP extends the boundaries for its classification of hamlets "well beyond established settlements" to allow for growth. 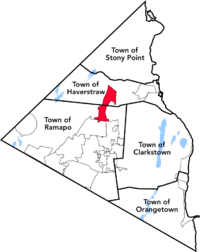 The village of Pomona (red) in Rockland County is partly within two different towns. In New York, a village is an incorporated area. About 85% of villages fall within a single town. Villages in New York State are classified by the Census Bureau as incorporated places. Like all municipal corporations, villages have clearly defined legal boundaries. A village is a municipality that provides services to the residents, services that may or may not include garbage collection, management of cemeteries, street and highway maintenance, street lighting, and building codes. Some villages provide their own police and other municipal services. Villages have less autonomy than cities. Those services not provided by the village are provided by the town or towns containing the village. As of the 2000 census, 9.9% of the state's population was living in one of the 556 villages in New York. The legislature of a village is the board of trustees, composed of a mayor and (usually) four trustees. The board is responsible for approving mayoral appointments, managing village finances and property, and approving a budget. The mayor, who is generally the chief executive of the village, may vote in all business before the board and must vote to break a tie. The mayor generally does not possess veto power, unless this is provided for by local law. Administrative duties of the mayor include enforcing laws and supervising employees. A village may also have a full-time village manager who performs these administrative duties instead of the mayor. In 2007, sixty-seven villages had such a manager. Some villages have their own village justice, while others utilize the justice of the town or towns in which they are located. While most villages are subject to a uniform statewide Village Law, twelve villages operate under charters issued by the state legislature prior to 1874. Before a revision to the State Constitution in that year, villages were formed by the state legislature through granting of charters. Many villages reincorporated, dumping their charters in favor of the Village Law. The villages that retain their charters are Alexander, Carthage, Catskill, Cooperstown, Deposit, Fredonia, Ilion, Mohawk, Ossining, Owego, Port Chester, and Waterford. These villages must still comply with those aspects of Village Law that are not inconsistent with their charters. A village may also be dissolved, returning all government control to the town level. The process of dissolution can be initiated by the village board itself, or upon the submission of a proper petition to the board. The village board must produce a "dissolution plan" that settles specific matters, such as the village's debts, its employees and property, and the financial impact dissolution would have on village and non-village town residents. This plan is voted upon by village voters only. Five towns are coterminous with their single village and have a coterminous town-village form of government. Despite its name, Greenwich Village is not a village. The boroughs were originally intended to retain some local governance in the consolidated city. Each borough individually elects a borough president and used to elect two at-large city council members, in addition to those elected based on each borough's population. The borough presidents once wielded considerable power as members of the New York City Board of Estimate, but the position is now largely ceremonial and advisory. Boroughs function as counties for certain purposes, but have no county government. Each of the five New York City district attorneys, however, are still elected by county (for example, the district attorney for Brooklyn is called the Kings County District Attorney). There are fifty-nine community districts in New York City, each represented by an appointed advisory group called a community board. Each board consists of fifty unpaid members appointed by the borough president. Half of the members are nominated by the City Council members who represent the area. The power of the community boards is very limited. They serve in an advisory capacity regarding land use and zoning, budget and various concerns of the community. The boards can recommend action on the part of the city government, but they cannot enforce it. Each is identified by borough name and a number (e.g. Manhattan Community Board 3). In New York, special purpose units of government provide specialized services only to those who live in the district, and are empowered to tax residents of the district for the services provided in common. Special districts often cross the lines of towns, villages, and hamlets, and occasionally cities or counties. School districts are the most common kind of special district in New York. They provide, arrange, or contract for all public education services, including special education and school transportation, the latter also for non-public schools. School districts are rarely precisely coextensive with the cities, towns, villages, or hamlets that bear the same name, meaning that a person living in one hamlet or village might send their children to a school associated with a different hamlet or village. Residents pay school taxes to the same school district in which they live and any children living with them attend school. All tax-paying residents are eligible for the STAR Program tax rebate, which in effect lessens the value of an individual's primary residence to lessen the tax burden on the residence. All but five school districts are separate from municipal governments. The exceptions are the five cities whose populations exceed 125,000 (Buffalo, New York, Rochester, Syracuse and Yonkers), in which education is part of the municipal budget. There are five types of school districts in the state, each with slightly different laws. Common school districts, established in 1812, were the first type of school district in the state. In July 2004, there were only 11 such districts remaining. They are not authorized to provide secondary education. They must, therefore, contract with neighboring school districts to provide high school education for pupils in the district. Typically one trustee or a three-person board of trustees will govern the district. In 1853, the legislature established union free school districts, which are districts resulting from a "union" of two or more common school districts, "free" from the restrictions that previously barred them from operating high schools. In July 2004, there were 163 school districts of this type. Despite being able to operate high schools, thirty-one of these districts provided only elementary education. Those districts that are not components of central school districts provide secondary education either by contracting with other districts or being located in one of the three central high school districts. Each union free school district is governed by a three- to nine-member board of education. Not to be confused with central high school districts, central school districts are the most prevalent type of school district in New York. In July 2004, there were 460 such districts. They began as a result of legislation in 1914. Central school districts may form from any number (including one) of common, union free, and/or central school districts. Central school districts are permitted to provide secondary education. Its board of education must consist of five, seven, or nine members and length of service must be three, four, or five years, each decided upon by the voters in the district. There are only three central high school districts in New York state, all in Nassau County (Bellmore-Merrick Central High School District, Sewanhaka Central High School District, and Valley Stream Central High School District). Central high school districts provide secondary education to students in two or more common or union free districts. With creation authorized by the legislature in 1917 and repealed in 1944, creation was reauthorized exclusively for Suffolk County in 1981. Such districts already established were not affected by the repeal. In those cities with populations exceeding 125,000 (New York City, Buffalo, Yonkers, Rochester, and Syracuse), the city school districts are coterminous with the city limits, and education is part of the municipal budget. These districts cannot incur debts or levy taxes. The governmental structure in all of these except for New York is that of an elected or appointed board of education. New York's public education is headed by a chancellor and has a 13-member all-appointed Department of Education Panel for Education Policy. The city school districts for the 57 cities having fewer than 125,000 people are separate from the municipal government and are authorized to levy taxes and incur debt. Each of them is governed by an elected board of education with five, seven, or nine members. Districts for smaller cities often extend beyond the city borders and are referred to as "enlarged city school districts", seven of which have reorganized as "central city school districts". Owing to the extremely large number (730) of school districts, many of which are quite small, most of them are organized into 37 supervisory districts. Each of these has a Board of Cooperative Educational Services (BOCES). Each BOCES provides services that are considered difficult for the member school districts to provide on their own, often including special classes for students with disabilities. Fire districts are public corporations that generally provide fire protection and other emergency response in towns outside villages. A fire district can levy taxes and incur debt just like other general purpose municipal corporations, although fire districts do not have home rule powers and the taxes are generally collected by the town or towns that the district serves. Fire districts depend on their towns for initial establishment, expansion of district territory, and dissolution, but are otherwise thereafter autonomous political entities able to exercise only those specific powers granted to them by statute. The district is governed by a board of elected commissioners. Villages generally provide their own fire protection, but joint town-village fire districts are permitted. A Joint Fire District is a fire district that encompasses more than one town, wholly or in part, and may also include a village. This is some times done to reduce duplication of services in a small area or to help spread the tax burden when there is a large difference in tax base between neighboring towns. A joint fire district may also be formed when a fire department in a village that has fire protection districts in the surrounding towns separates itself from the village government to obtain greater self-governance. This was seen in 2003 when the fire department in the village of Baldwinsville formed a joint fire district consisting of the village of Baldwinsville and parts of the towns of Lysander and Van Buren in Onondaga County. There were 868 fire districts in New York at the end of 2003. A fire protection district is established by a town board in order to contract fire protection services with any city, village, fire district or incorporated fire company. Unlike fire districts, fire protection districts are not authorized to levy property taxes and do not have an independently elected board of commissioners. The levy to support fire protection districts is part of the town levy and the oversight of the district is via the town board. Public benefit corporations in New York operate like quasi-private corporations, generally with boards appointed by elected officials. They are a form of government bureaucracy in one sense but, unlike government agencies, public benefit corporations are exempt from some regulations. Of particular importance, they can take out their own debt, allowing them to bypass legal limits on state debt. This allows them to make potentially risky capital and infrastructure investments without putting so much of the credit of New York on the line. However, it also allows them to avoid many of the oversight and reporting regulations that apply to state government. Public benefit corporations get charters from New York and are usually designed to perform a specific, narrow function in the public interest. The Metropolitan Transportation Authority manages public transportation in the New York Metropolitan Area (this includes the New York subway and public bus systems, as well as Metro-North Railroad and the Long Island Rail Road, and the Triborough Bridge and Tunnel Authority). The New York State Thruway Authority originally only maintained the New York State Thruway from New York City to the Pennsylvania border southwest of Buffalo, but due to budgetary maneuvering, now maintains the toll-free Interstate 287 corridor, and the New York State Barge Canal. Many regions also have authorities to manage their local public transportation such as the Central New York Regional Transportation Authority, which manages much of the public transportation in and around Syracuse; and the Capital District Transportation Authority for the Capital District area around Albany, Schenectady, Troy, and Saratoga Springs. At the end of 2005, there were 866 public benefit corporations, of which 266 were public authorities. Library districts are usually coextensive with the same school district but raise taxes separately and serve all the residents of the library district. They often form cooperative associations with other library districts for shared services, purchasing and cross-library lending. Other special districts may include emergency rescue squads (also known as Consolidated Health Districts), sanitation, police, water, sewer, park, and parking. ^ Gibson, Ellen M.; Manz, William H. (2004). Gibson's New York Legal Research Guide (3rd ed.). Wm. S. Hein Publishing. pp. 257–258. ISBN 1-57588-728-2. LCCN 2004042477. OCLC 54455036. ^ a b Local Government Handbook, p. 67. ^ a b c d e Local Government Handbook, p. 51. ^ a b c Local Government Handbook, p. 60. ^ a b c d e Local Government Handbook, pp. 29-37. ^ a b c Local Government Handbook, p. 39. ^ a b c d e f g h Local Government Handbook, pp. 68-70. ^ "Individual State Descriptions: 2012" (PDF). 2012 Census of Governments. United States Census Bureau. September 2013. p. 203. ^ Governor Eliot Spitzer (2007). "Executive Order No. 11: Establishing the New York State Commission on Local Government Efficiency and Competitiveness" (PDF). State of New York. p. 1. Archived from the original (PDF) on August 12, 2007. Retrieved 2009-04-03. ^ Local Government Handbook, pp. 48-49. ^ Local Government Handbook, pp. 42-43. ^ Overview of Geneva city near county borders (Map). USGS (ACME mapper). Retrieved 2009-06-25. ^ a b "Census Glossary". American FactFinder. pp. Incorporated place. Archived from the original on March 22, 2009. Retrieved April 5, 2009. ^ a b c Local Government Handbook, pp. 51-52. ^ a b c d e Local Government Handbook, pp. 67-68. ^ "City Charter". City of Sherrill. p. Title I, Section 3, final sentence. Archived from the original on May 2, 2009. Retrieved 2009-04-05. ^ a b c Local Government Handbook, p. 6. ^ a b c d e Local Government Handbook, pp. 53-55. ^ a b Mohan, Geoffrey. "Nassau's Difficult Birth; Eastern factions of Queens win the fight to separate after six decades of wrangling". Newsday, Inc. Archived from the original on October 16, 2008. Retrieved 2009-04-09. ^ "New York official county websites". Archived from the original on April 8, 2009. Retrieved April 5, 2009. ^ Local Government Handbook, pp. 54-55. ^ "Census Glossary". American FactFinder. pp. Town. Archived from the original on March 3, 2009. Retrieved April 5, 2009. ^ Local Government Handbook, pp. 59-66. ^ a b Local Government Handbook, p. 61. ^ Local Government Handbook, pp. 61-62. ^ a b Local Government Handbook, p. 62. ^ "Detailed U.S. Census Bureau map of New York" (PDF). 2000. pp. "p. 4, Note the towns of Champlain (Clinton County), Chateaugay (Franklin County), and Bellmont (Franklin County)". Retrieved 2009-06-13. ^ "Legal Memorandum LG06". New York State Office of General Counsel. Archived from the original on June 6, 2011. Retrieved 2009-05-18. ^ a b c "Census Glossary". American FactFinder. pp. CDP. Archived from the original on March 28, 2009. Retrieved April 5, 2009. ^ "Participant Statistical Area Program: Census Designated Places (CDPs) Census 2000 Criteria". US Census Bureau. Archived from the original on November 7, 2002. Retrieved April 8, 2009. ^ "New York: 2000 Population and Housing Unit Counts" (PDF). September 2003. pp. III–3 to III–19. Retrieved 2010-12-22. ^ a b Census Designated Place (CDP) Program for the 2010 Census - Final Criteria Archived October 20, 2012, at the Wayback Machine, Federal Register, February 13, 2008 (Volume 73, Number 30). Retrieved 2008-12-05. ^ Gibson, Campbell (July 9, 2008). "Population of the 100 Largest Cities and Other Urban Places In The United States: 1790 to 1990". U.S. Census Bureau, Population Division. Archived from the original on June 9, 2009. Retrieved 2009-04-12. ^ a b General Land Information (Map). Suffolk County Department of Information Technology. Archived from the original on 2010-09-17. Retrieved 2010-09-06. ^ "Map of hamlets and villages within the Town of Islip". "Map of North Bay Shore CDP". Archived from the original on June 7, 2011. ^ "Appendix 11B Decorative Community Gateway Signing and/or Landscaping on State Highway Right of Way" (PDF). New York State Department of Transportation. p. 8. Retrieved 2009-04-16. ^ The Urban Design Project. "The Western New York Southtowns Scenic Byway: Volume 2- Corridor Management Plan; Section VII. The Signage Plan" (PDF). University at Buffalo (SUNY). p. XII–3 (PDF 5). Retrieved 2010-09-06. ^ "Guilderland Center Hamlet Plan". Behan Planning and Design. May 12, 2009. Archived from the original on July 7, 2011. Retrieved October 7, 2009. ^ "Proposed Hamlet Zoning Changes". 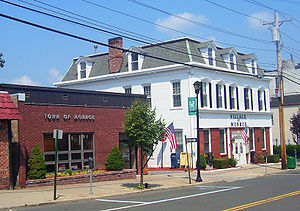 Town of Wilton. August 7, 2008. Archived from the original on July 31, 2012. Retrieved 2009-10-07. ^ "Town of Williamson Route 21 & 104 Gateway Study: Executive Summary" (PDF). Archived from the original (PDF) on July 26, 2011. Retrieved October 7, 2009. ^ a b Local Government Handbook, pp. 72-73. ^ New York State Gazetteer. Albany, NY: New York State Department of Health. 1995. Available at New York State Library Digital Image Project Archived October 2, 2006, at the Wayback Machine. ^ "Adirondack Park Agency: Land Use Classification". New York State Adirondack Park Agency. Retrieved 2009-04-15. ^ a b c Local Government Handbook, p. 70. ^ Local Government Handbook, pp. 70-71. ^ Local Government Handbook, p. 71. ^ a b New York Consolidated Law: Village, Article Two, Section 2-200, Population and area requirements. Retrieved 2011-12-08. ^ "The Gold Coast of Long Island". Eldridge successfully lobbied the state legislature and the governor of New York to change the state law’s minimum requirement to organize a village from 250 residents to 50. By including his family and his servants, Mr. Eldridge incorporated his estate and set a precedent that was emulated throughout the Gold Coast...the huge upsurge in the population in the twenties witnessed no less than twenty-one "golf club" village incorporations. Many of these "villages" were little more than three or four estate owners banding together to form a municipality. ^ a b c d Local Government Handbook, p. 75. ^ "School Directory". New York City Department of Education. Archived from the original on September 28, 2007. ^ Local Government Handbook, pp. 75-76. ^ a b c Local Government Handbook, p. 76. ^ a b Local Government Handbook, pp. 76-77. ^ "About". Sewanhaka Central High School District. Archived from the original on August 24, 2009. Retrieved July 14, 2009. By the late 1950s, the post war baby boom had changed the single high school into a Central High School District with five buildings, serving students in grades 7 through 12. ^ "Our District --District Data & Staff". Valley Stream Central High School District. Archived from the original on 2008-06-12. Retrieved 2009-07-14. The Valley Stream Central High School District is one of only three New York State Districts covering grades 7-12 exclusively. ^ "School District Index". New York State Education Department. Retrieved 2009-07-30. ^ "BOCES of New York State". Boards of Cooperative Educational Services in New York State. Archived from the original on April 12, 2009. Retrieved July 30, 2009. Welcome to the www.boces.org, the Web site representing all 37 Boards of Cooperative Educational Services (BOCES) in New York State. ^ a b c d e Local Government Handbook, p. 79. ^ a b Local Government Handbook, pp. 79-80. ^ "Frequently Asked Questions". Firemen's Association of the State of New York. Archived from the original on March 14, 2015. Retrieved February 26, 2015. ^ Local Government Handbook, p. 81. ^ Local Government Handbook, p. 159. Local Government Handbook (PDF) (6th ed.). New York State Department of State. 2009. This page was last edited on 8 March 2019, at 04:23 (UTC).